They placed you in my arms and you, my sweet boy, quickly slipped into my heart. I don't know how you found us, I don't know what made you decide to come to us, but you completed our family a year ago today. We didn't realize we were missing such an important piece of our family puzzle but you made us whole. You made Anna a big sister and you gave her a live-in best friend. You made dad beam with pride and filled my heart with love. You have a smile that warms an entire room and a laugh that's contagious. You bring love where ever you are. We are so lucky that you picked us, so lucky to have you to watch over for these precious few years. 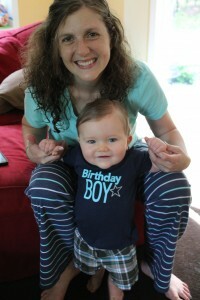 Happy first birthday sweet baby Cole. Last month, there was a commercial from Dove Soap that hit Facebook and went viral. The next phase was people posting hate against the company for "showing that beauty is only on the outside" or "only comes from the young" and "just sell soap". Then, yesterday a HORRIBLE article hit about Abercrombie that literally showed all that is wrong with the definition of beauty. Here's the thing, I'm a mom to a little girl. I grew up thinking that I wasn't pretty enough, thin enough, good enough, or strong enough to succeed. I, TO THIS DAY, fight this battle within me and fight for my daughter to NOT have it within her. Beauty is all around us and within us. The problem is we live in a world that keeps reminding us to only talk about our faults. Women especially. It's about literally taking their self-esteem away, and having them feel ugly from the inside out. It's about making our girls (who WILL become women in moments) realize that they are wonderful, strong and will succeed. It's not about teaching them that blue eyes are pretty, but that your eyes dance when you laugh. It's not about teaching them that their freckles need to be covered up but that your face glows when you have a new idea. Get it? But instead, we see the worst in ourselves and therefore teach our kids to see the worst in themselves. The real message is that real beauty is yours if you own it. So own it girls!